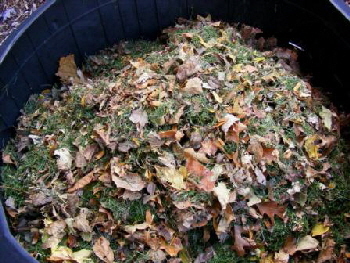 An ideal starter mix for compost is about half to three quarters dry material with half to one quarter green material. Fall is and ideal time to acquire large amounts of dry material with fallen leaves. And if you have a mulching mower with a bag attachment you can make a lot of starter mix with almost no effort. Normally in fall you should have started dropping your mower blade to get the grass shorter and shorter as we approach snowfall. But if you blade is too low you may wind up just pushing the leaves along as you mow, so pay attention on your first swipe to see if the leaves are being pushed out of the way are if they are being mowed up. You may have to raise up one or one half notch. If a lot of leaves have dropped and you have a thick layer on the lawn the mower deck will just push most of the leaves out of the way. This works best when leaves have just begun to fall. If you raise the deck high enough to pull and mulch the leaves, you will probably not be cutting any grass with the leaves. Leaves are much lighter than grass so you may not realize your bag is full, it will fill quickly. 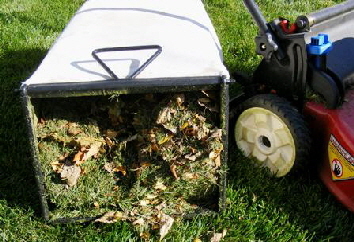 If you notice that the mower is leaving a trail of shredded leaves, your bag is probably full and the grass and leaves are expelling rather than going into the bag. My mulching mower does not shred up leaves as well as my shredder/vac but they get mulched well enough to compost. Dump the mix into your compost bins and keep turning them until it just gets too snowy and cold to tend the compost. Take note of how your mix looks and if you need more dry add just shredded leaves as the leaves continue to fall. Even if you have a good ratio of brown to green you should continue to add kitchen scraps and lawn debris to make an ideal compost. If you have a lot of leaves you do not need a bin or barrel, just start a heap. Come spring you can never have too much compost!